Who is the Pub Raider? When there is a sign next to the bar which announces opening times from 6am – 8.30am then you know you’re onto a winner. The Market Porter is nestled right next to Borough Market itself and is a must if you’ve decided to visit said market to brave the throngs of people browsing endless stalls for exotic sausages, posh bread or maybe honey made on someone’s roof. Once you’ve loaded up on unnecessary food and have tired of tripping over wheely suitcases head to the corner of Stoney Street for refreshment. There are some fantastic aspects to this pub and some bit of it that are a little bit pants. There is an excellent selection of beers with nine different real ales on offer at any one time, a collage of pump badges towards the back of the bar attests to the variety of ale that has been through the taps over the years and comfortably reassures you that a repeat visit will provide a few new treats. The front bar is ‘rustic’ and has dispensed with troublesome chairs; instead punters perch their pints on barrels. This is probably a smart move in one of the most bustling pubs in the city but it can be a bit disappointingly uncomfortable especially if you’ve had a bit of a walk around the market. Warmer months see the crowd quite rightly spill out onto the cobbled streets around the outside adding their hubbub to the steady hum of stalls which have been trading on this site since 1755. 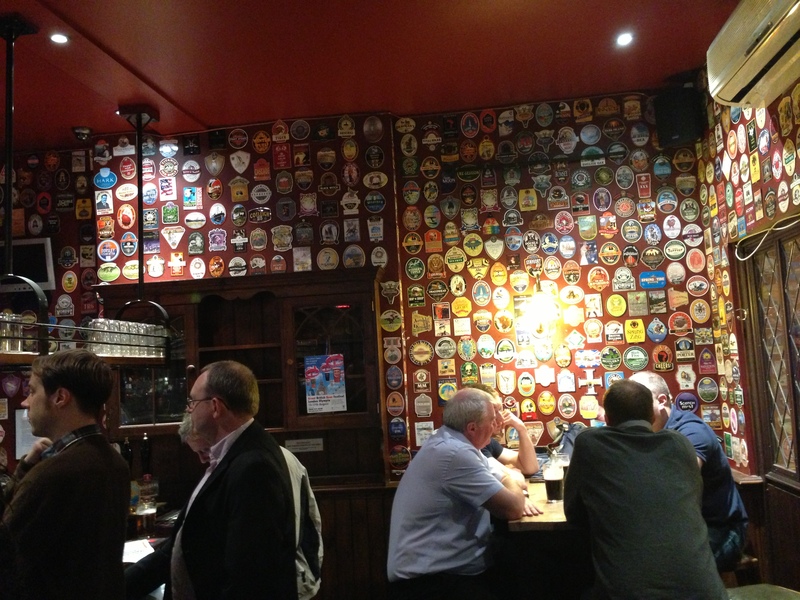 Back in the bar however there are one or two cracks in the visage of this quite quintessential East London Boozer. The staff, although friendly, don’t really know anything about beer so you’re on your own choosing your tipple which isn’t a clincher for me but is a shame when there is so much on offer. Secondly the recent refurb, which has retained authenticity in the front bar, has made the rear seating area look like a 1980’s conservatory crossed with a half finished cold war bomb shelter. These shortcomings are minor though and really ought to be overlooked. 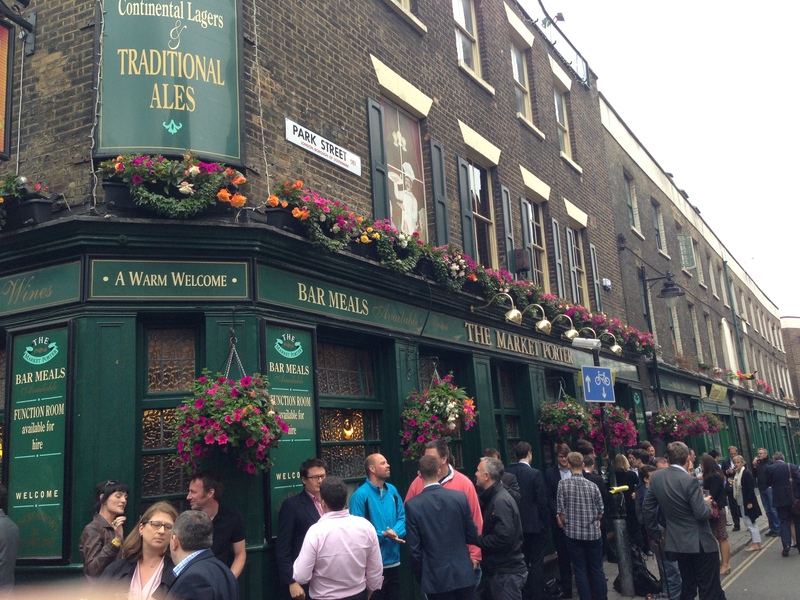 For anyone seeking a slice of ‘proper London’ a pint here is utterly essential. The traders drop in for an early morning beer and have done for centuries and whilst I’m not suggesting you arrive to sup with them at 6am I would certainly recommend at least one pint if you’re considering paying them a visit and braving the foodie melee.